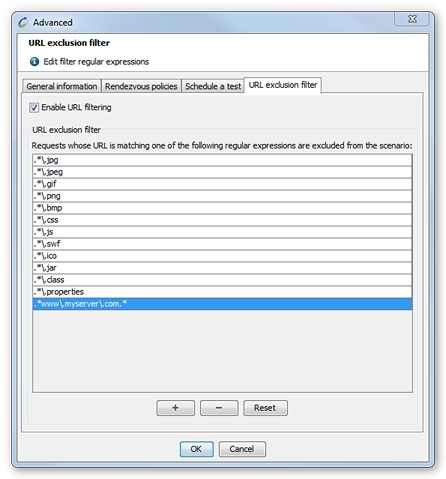 Requests whose URL corresponds to one of the regular expressions in the exclusion filter are excluded from the scenario and are ignored during the test playback. Likewise, the resulting empty pages and Containers will be deleted. A filter can help exclude the requests whose URL corresponds to a file type or a portion of the application. For example, the filter .*www\.myserver\.com. * makes it possible to ignore all the requests sent to the server www.myserver.com from the test playback.